Always call our office at 404-508-1177. After 5:00pm and on weekends you will hear a message that will guide you. Listen carefully and follow the prompts. Most times you will leave a message and the doctor on call will receive the page, hear your message, and call you back. After 9:00 pm on weeknights and after 2:00 pm on weekends your call will be transferred to our answering service. You will then have the option of being transferred to the nurse line offered free of charge by your insurance company or having the doctor on call paged. There is always a doctor on call and available 24/7 for after hours urgent and emergency advice. The best system can always have technical glitches, so if your call is not returned within an hour (usually within 30 minutes) please call back. Call 911 for a true emergency, like a severe allergic reaction, prolonged seizure, serious injury such as a fall with loss of consciousness or a large burn, severe wheezing, or difficulty breathing. For less serious emergencies, but those that require after hours care, like a cut that needs stitches, or a ≤ 2 month old with a rectal temp of ≥100.4, we recommend going to Children’s Health Care of Atlanta or a pediatric ER. We always want you to call if you are worried about a new symptom or change in your child’s condition that you don’t feel can wait to be discussed with us during regular office hours. Some examples include wheezing with breathing difficulty, possible dehydration, and rectal temperature ≥ 100.4 in a less than 3 month old infant. We have put a lot of information on this site to help you learn more about some of the common pediatric questions including fever, Tylenol doses, colds and cough, earaches, over the counter medications, croup, vomiting and diarrhea, and minor injuries. Please read first to help decide if you should call. Use this web site! There are many answers about common questions and links to other web sites that can be of great help. You may also call, free of charge, the nurse lines offered by many insurances (see list, or check on your insurance card). 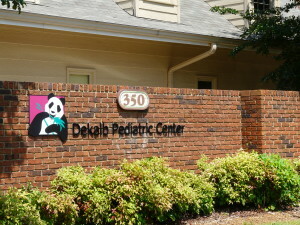 Remember, our office nurse is available for routine questions from 9:00am-5:00pm daily, and if you are worried about your child’s condition and feel that your questions can’t wait, you can always reach the doctor on call at 404-508-1177. Tylenol (acetaminophen) and Motrin (ibuprofen, over 6 months) are safe for fever and pain. Cold and cough medicines are not recommended for children under age 2 years and are used sparingly, if at all, for children under age 6 years. Read all about OTC meds and other symptomatic relief advice here. Most illnesses in children are viral and don’t require antibiotics. It is important for your child to be seen first to decide if antibiotics are necessary, so in general we do not call in antibiotics over the phone. However, instead of requiring an office visit, when medically appropriate and by your choice, we may call in medicine for certain illnesses, such as “”pink eye”. There is a $15.00 charge for this service, both during the day and at night. Fever is an increase in body temperature, usually triggered by a viral illness and occasionally by a bacterial illness. It is a symptom and can not in itself harm your child. It is important to look at what else is going on with your child. Read all about fever and doses of Tylenol and Motrin here. Be sure to look at the label on the box of acetaminophen and match the amount you are dosing in mg to the amount specified in ml on the dropper or measuring cup. It is always safest to use the measuring device included in the package.